We had a lovely Flyball demonstration at the Cow Palace a couple of weeks ago, in conjunction with the Golden Gate Kennel Club Dog Show. 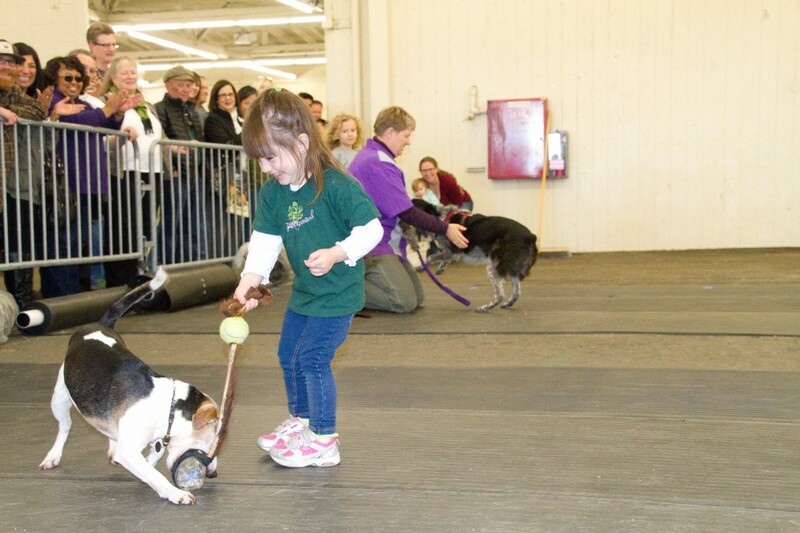 As part of the demonstration, our daughter had the opportunity to compete in “singles” racing with a teammate’s dog. 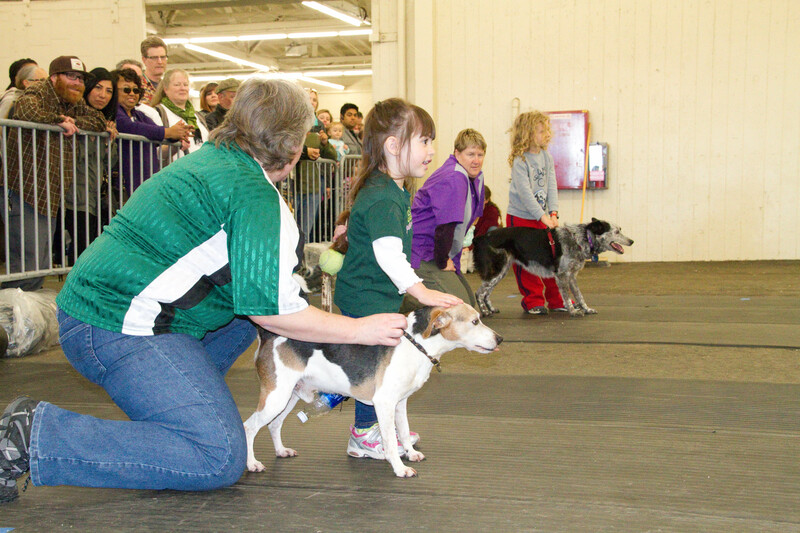 (Singles in Flyball is one-on-one racing, rather than the usual relay-style racing which involves 4-dog teams). I commented to colleagues that I was more proud and excited than I’d ever been when racing new dogs, and the other moms agreed whole-heartedly. So I got to daydream that my kid would someday be a top dog trainer or a top competitor. Of course, I’ll be happy if she just ends up loving working with dogs as much as I do. Teaching a child to work with a dog is more complicated than it may appear. Training is much more involved than simply coexisting safely, and there are many variables that must be taken into account when working with children and dogs together. 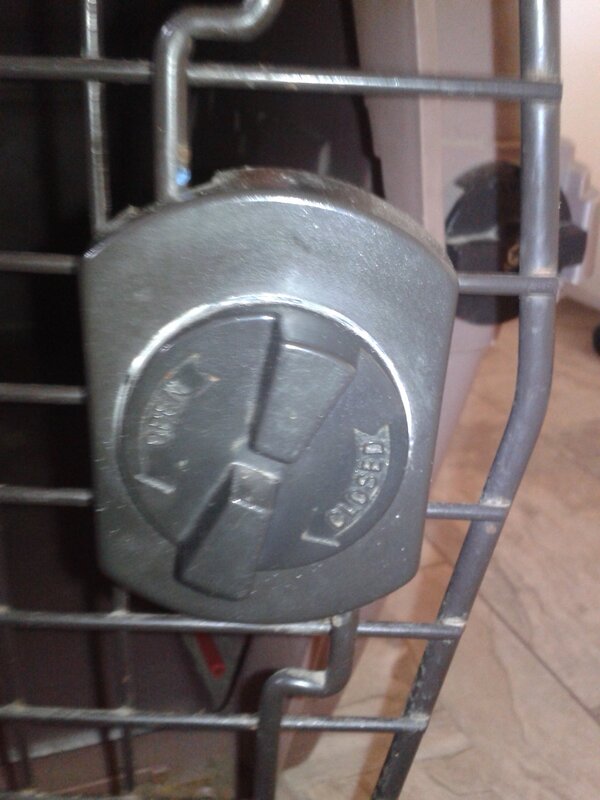 In the past, I’ve written that children should train dogs using only the most modern, reward-based methods. This is for many reasons, including that children’s timing may not be as good, and delivering an ill-timed reward would have far less negative impact than delivering an ill-timed “correction”. Furthermore, many dogs are not entirely comfortable with children in the first place, so it is doubly important that all interactions with them remain positive. We began Shelby’s training with my colleague’s dog, Solo, by having her simply make friends with him. He is a great and stable little dog, but was sometimes wary of children. So we had her throw balls for him on a weekly basis. Over time, he began to bring her balls to throw, and eventually willingly engaged with her in a closely supervised game of tug. Using a toy that he’s accustomed to using, and on which he targets only the end piece, made this task easier and safer overall. Next, we had to teach them to stand at the starting line together. As you can see, we had Shelby simply put her hand on Solo’s head, while his owner actually held him. This reduced the likelihood of him attempting to take off running with Shelby still holding onto his collar. Choosing the appropriate dog for a child is also important. In addition to being a stable, well-trained dog, Solo is also small enough for Shelby to handle safely. His natural way of tugging is to hold the very end of his toy, so there is little chance of him accidentally biting her fingers during the game. There are many dogs, including two of our own, whom I would never trust in a tug game with a child due to the possibility of little fingers getting too close to teeth. In fact, outside of this type of very closely controlled setting, I recommend strongly against the tug game between children and dogs. Finally, there is the challenge of assuring that the child follows directions and does not do anything to inadvertently upset the dog. This is fundamentally what I term “Respecting Your Dog”, that is, honoring your dog’s cut-off signals and making sure that what you do with him or her is not needlessly uncomfortable or stressful. Involving children in dog sports offers so many benefits, including many of the same rewards as other sports, such as learning to cooperate, being a good sport whether winning or losing, and learning how to be competitive. It also involves risks not so inherent in many other sports, and thus must be undertaken with more care and thoughtfulness. Nevertheless, it can be extremely rewarding for everyone involved. I, for one, look forward to more years of Shelby competing with us, though I recognize that she may eventually decide that Mom is just not cool enough to hang out with and decide to go off to a sport of her choosing. Yes, you read that right. Our almost 3-year-old daughter just got her own crate to play in, and she couldn’t be happier. Note the smile on her face in the photo. 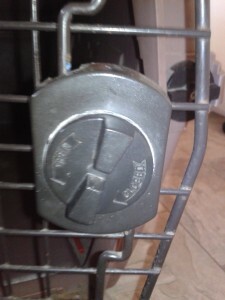 Step one was to replace Shadow’s easy-open crate with one that has the traditional spring-latch door that is not so easily opened. I was quite pleased with myself, until Shadow left his crate to go outside, and Shelby promptly crawled back inside to hang out there with her Orange Tiger and other stuffed animals, leaving Shadow once again without a home base to return to when he came back inside. I had a conversation about this with our roommate, my good friend, and she reminded me of how much fun “forts” were to make when we were younger. We recalled the various ways in which we had made forts for ourselves when we were kids, and it occurred to both of us that perhaps Shelby really needs a fort of her own. Since there is never a shortage of extra crates in our household, we thought, what better option than to give her Shadow’s old crate, which we knew was already comfortable for her? When I asked Shelby if she’d like her own crate to hang out in, her face lit up like a Christmas tree. She was so excited that she helped me to clean and scrub it, then put her own big blanket in it. She could hardly wait to cram all of her favorite toys (mostly stuffed animals) into it, and crawl in alongside them to hang out. Problem solved… unless CPS comes calling? 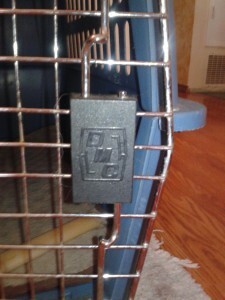 Hopefully they are dog-lovers with crate trained dogs, and then they will certainly understand! So now Shelby gets to hang out in her crate and Shadow has his hallowed den back as his safe space to get away from the kiddo if he needs to. 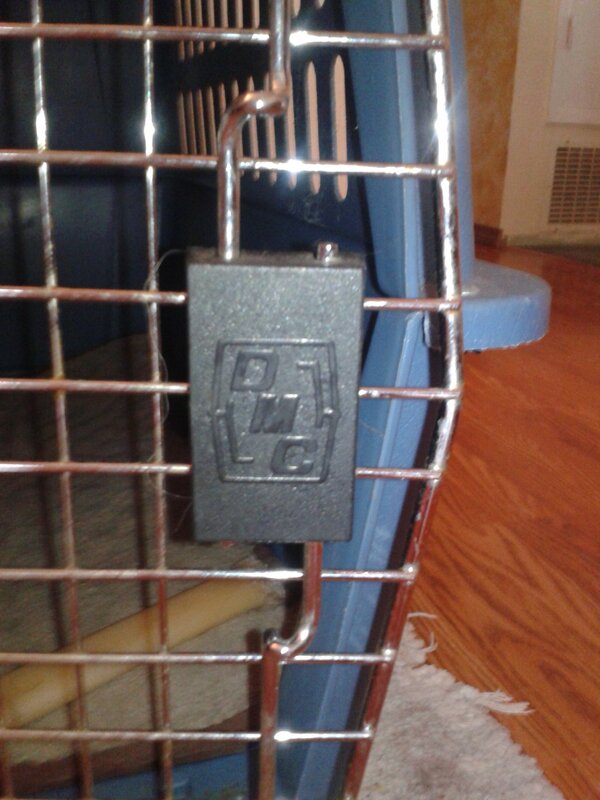 But best of all, his crate door latches solidly shut so that I can comfortably leave the room if I’m doing chores without worrying about how Shelby might annoy him next. Sigh… peace… at least for now.